After the GUI was designed with minimal features, the next task was to develop the cardinal search function. Indubitably, a well-run search application/engine requires indexing. Search Application/Engine Indexing basically collects, parses and stores data to facilitate fast and accurate information retrieval. That being, the index for sQuick was built using the Dictionary data structure in Pharo which works like HashTable of other programming languages/platforms. 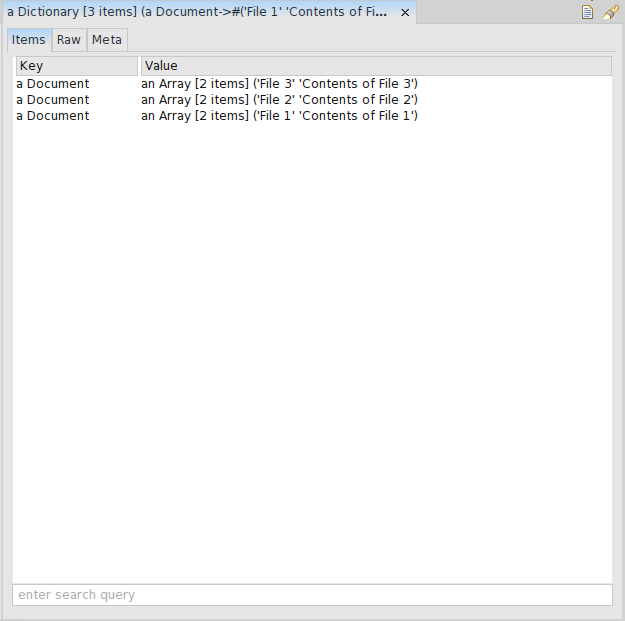 The contents of the text files present in the current Pharo image were split at whitespaces and added to the index along with the corresponding file title. tokens := ‘ ‘ split: aDocument contents. The method #indexFiles was used to iterate over all the text files in the current Pharo image to index all the files before the searching begins. The #queryString method has been temporarily build using #includesSubstring which matches the user input string with all the entries of the index and gives the result in an array form with #tally output as the number of search results.